Gentle Acne Mud Mask | This is not your typical clay mask. This is a creamy combination of French Green Clay + Organic Hemp Seed Oil + Hyaluronic Acid that soothes your skin as well as reduces inflammation and redness. The huge dose of Hyaluronic Acid helps give skin a drink while the mask dries. Applied to wet skin, this mask works hard, gently. This is NOT a mask that makes your skin feel dry and tight. This mask will unclog pores + reduce redness + hydrate + smooth + reduce the appearance of pimples quickly. This is not just a clay mask that detoxes, but it actually helps remove clogged pores while delivering skin-loving ingredients to your skin. You can also customize how you use it, and even use it as a cleanser! Have a little longer? Skin need some serious love on Sunday mask day? Apply a layer the thickness of a dime and let sit 10-20 minutes. Remove with warm water. While this won't remove your makeup, it is a perfect cleanser for days when you aren't wearing makeup or after Oil Cleansing. Simply massage enough into wet skin to make a light cream and then rinse! Organic Hemp Seed Oil stole my heart with the deep green hue and delicate nature. It has so many benefits for so many skin conditions; it is surely the empress of oils! This mask is an homage to the star of Bear's Beauty. Organic Tamanu Oil has a well-documented history of healing + soothing + reducing scarring + reducing acne. Organic Willow Bark is rich in natural Salicylic Acid and helps reduce redness as well as breakouts. This amazing natural bark has been used for centuries for its unique anti-inflammatory properties. 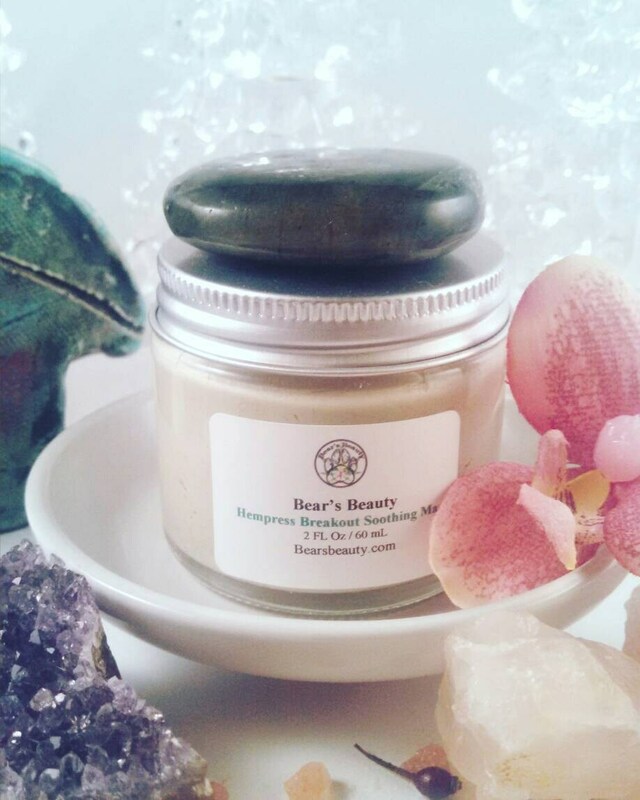 French Green Clay refines pores. Georgia Kaolin Clay, gentle white clay that plays co-host to Organic Hemp Seed Oil. Kaolin Clay gently detoxifies skin while not stripping it of the moisture barrier. Bentonite Clay : Unique lava clay, Bentonite has the very unique ability to absorb and encapsulate toxins. This makes it ideal for applications like masks and deodorants. It not only helps detox the skin, but takes the toxins with it when rinsed away. Hyaluronic Acid Serum is infused into the mask, able to absorb almost 1000x's it's weight in water, and combined with Organic Aloe Vera. The combination boosts moisture levels instantly. White Sage + White Thyme + Russian Sweet Birch + French Lavender help to further reduce redness and calm skin.